Will Peck’s practice focuses on the misuse of common technology: observing and recording points where devices pass beyond their intended functions and become autonomous time-based acts. Whilst dwelling in their own materiality, the captured processes provide glimpses into the way technology sees. The exhibition presents drawings, scans, prints and video made by working with common tools towards lyrical ends. 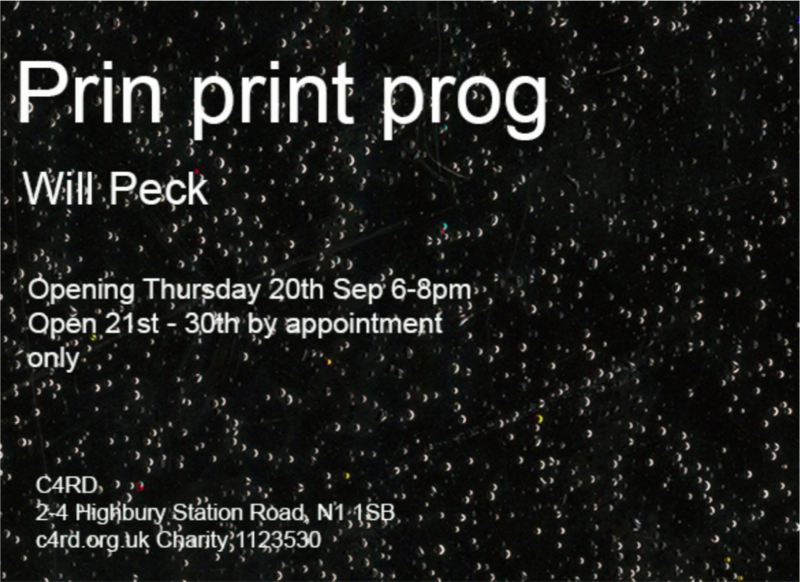 Will Peck is a MA graduate of the Sandberg Institute in Amsterdam and The Cass in London. Recent exhibitions include Log lights at Mumei, Tokyo, Ipswich Annual Biennale, Ipswich, Open Field at The Cass, London. The work can be viewed during the reception or by appointment to willpeck22@hotmail.co.uk at 2 – 4 Highbury Station Rd, Highbury Islington N1 1SB, London. C4RD is a Registered UK Charity 1123530, and would particularly like to acknowledge the support for of the Dovehouse Trust for this exhibition.